How to setup your homepage banners? Go to wp-admin - Appearance - Widgets - HomePage Banner area - Place T- Homepage Banner and T-Instant Search widget here. If you want to set the map here instead of Image banner place T - HomePage Map - Multicity widget and remove the instant search widget from this area. 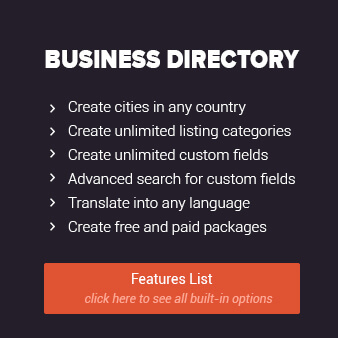 You can check this link How to make a specific listing featured? To add the youtube video here go to Appearnce - Widgets - HomePage Main content 3 - Text widget. Here in iframe tag you can place your youtube URL to show you youtube video. To setup this widget go to Appearance - Widgets - Homepage Main Content - place T-Popular Widget here. Select the listing post type, categories, list view or grid view, sorting options and save the settings. How to create different pricing tables? How to make a specific listing featured? Templatic offers world class WordPress theme support and unique, highly innovative and professionally useful WordPress themes. So glad to have found you! All the best and many more years of creativity, productivity and success. Templatic has the best WordPress Themes and an exceptional and out-of-this-world customer service. I always receive a response in less than 24 hours, sometimes in less than one hour, this is amazing. I will recommend it to all my friends. Keep up the good work!